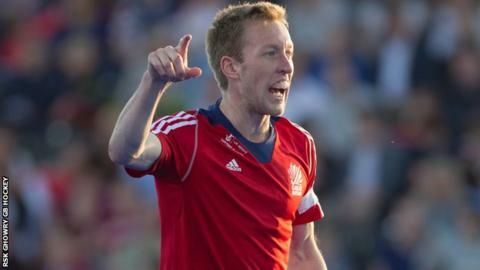 Great Britain sealed a 2-1 series victory over Argentina after winning the deciding match 5-3 at Bisham Abbey. Barry Middleton slammed home the opener for his 100th goal in international hockey and in the third quarter Chris Grassick fired a backhand shot for 2-0. Ashley Jackson sent in a low penalty corner before Gonzalo Peillat converted a penalty stroke for the visitors. Grassick hit another backhand flick and in the final quarter Sam Ward made it 5-1, before two late Argentina replies. It was an impressive comeback from the British squad, who lost the opening match 3-2 on Monday but levelled the series with a 2-1 victory on Wednesday. Their focus now turns to the World League Final in India, which starts on 27 November. "It's been a long couple of weeks but physically the team are in good shape and that's pleasing," head coach Bobby Crutchley said. "There's plenty to work on but plenty to be pleased about." "My philosophy around World League selection is to give us an idea of what players can do as we look towards the Olympics. We'll probably use a different squad than we have previously. We're not just doing it for the sake of giving people a go, it's because we believe these players are good enough and we'd like to see what they can do."